Two works of art at the Metropolitan Museum of Art, “Studiolo from the Ducal Palace in Gubbio” (1478–82) designed by Francesco di Giorgio Martini and “Panoramic View of the Palace and Gardens of Versailles” (1818-19) painted by John Vanderlyn are excellent pieces to be used in the evolving construction of the history of media art puzzle. Both of these works create an artificial realm that integrates the observer in a 360-degree immersive environment utilizing illusion and space to give the viewer the impression of being at a location—both real and imagined. 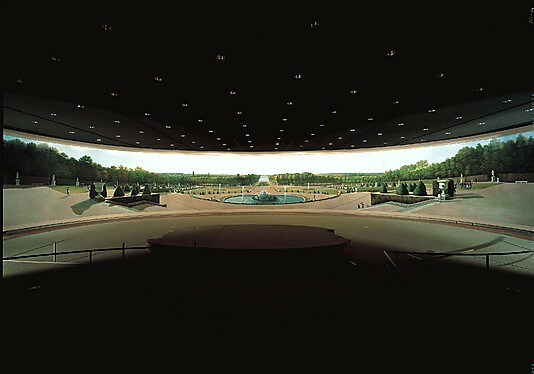 John Vanderlyn’s “Panoramic View of the Palace and Gardens of Versailles“, which measures 12 x 165 feet (circumference) presenting a circular panoramic view of the grounds of the French royal palace, is one of the earliest American panorama paintings known to have survived in its entirety. Using curvilinear perspective, the painting’s intent was to give patrons the illusion of being in the midst of Versailles. Placing himself in the painting, Vanderlyn can be seen pointing to Czar Alexander I and King Frederick William II of Prussia near the Basin de Latone. 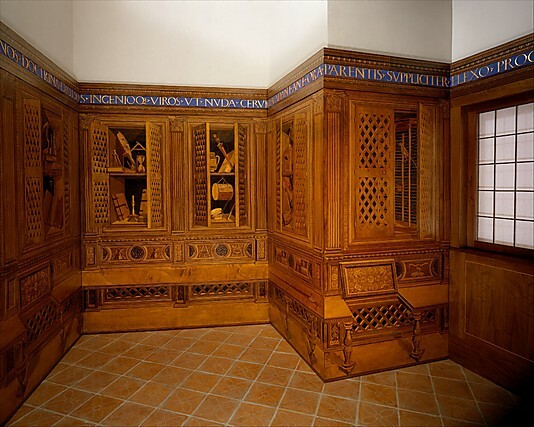 Francesco di Giorgio Martini’s “Studiolo from the Ducal Palace in Gubbio” utilizes a perspectival wood-inlay technique to create a virtual space of a sixteen by twelve foot study or library that displays a stunning array of objects—from musical instruments to astronomical tools to armor and insignia—meaningful to the duke of Urbino, Federico de Montefeltro for whom this was created. Intended as a place for meditation and study, the coherent perspectival design of its paneling along with the dramatic use of light and shadow, creates a unified space that is immediately understood by the viewer—creating an illusion of a place in time. Both of these works may be found in the Museum’s permanent gallery exhibition spaces. Metropolitan Museum of Art. (No Date). Studiolo from the Ducal Palace in Gubbio. (Retrieved on September 11, 2012 from http://www.metmuseum.org/Collections/search-the-collections/120013532). Metropolitan Museum of Art. (No Date). Panoramic View of the Palace and Gardens of Versailles. (Retrieved on September 11, 2012 from http://www.metmuseum.org/Collections/search-the-collections/20013426). Raggio, O., Wilmering, A. (1996). The Liberal Arts Studiolo from the Ducal Palace at Gubbio. The Metropolitan Museum of Art Bulletin, Spring 1996. New York: Metropolitan Museum of Art. Vanderlyn, J., Ten Eyck Gardner, A., Majewski, L. (1956). The panoramic view of the palace and gardens of Versailles painted by John Vanderlyn : the original sketches of which were taken at the spot, by him, in the autumn of 1814. New York: Metropolitan Museum of Art.